To all at Harmony, I would like to thank you all very much. For the Lady who has been cleaning and ironing for Mum, she has been very good. We provide a full range of domiciliary home care services across South London to the elderly, disabled and housebound in their own homes on a one to one basis. Our management team has a wide range of skills and abilities which are harnessed to ensure the highest possible standard of domiciliary care. Working throughout South London, Harmony provide respectful and compassionate domiciliary home care to a wide range of service users, each with their own tailored care plan based on their needs and requirements. Our care staff are supervised, monitored and trained to ensure that a high standard of service is achieved and maintained. One of the main aspects of our domiciliary care service is the fact that our services are tailored towards the individual and their personal requirements. With care staff based all over South London, we can also respond quickly to any change in circumstance. 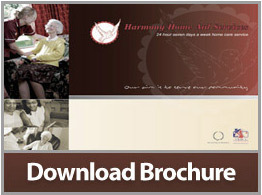 Harmony understand that when even being at home, alone can be a daunting experience if you know you're vulnerable. 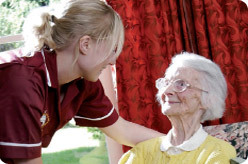 Not only does our home care services help deal with health issues and provide protection against any mishaps that may happen but help ease the feelings of vulnerability and loneliness that old age and health concerns can provoke in people. Our staff aren't only trained care professionals, but can help provide a sense of companionship in the home. We will help with all this as well as your day to day issues, from shopping to housework. We believe in our community and we believe that when the community that helped raise up are in need, we should be there for them, which is why we provide care when even the home can be a daunting place to be. Please note that this list is not exhaustive; to discuss more bespoke domiciliary home care services, please contact our South London based team on 0208 698 991 and we will be happy to assist.